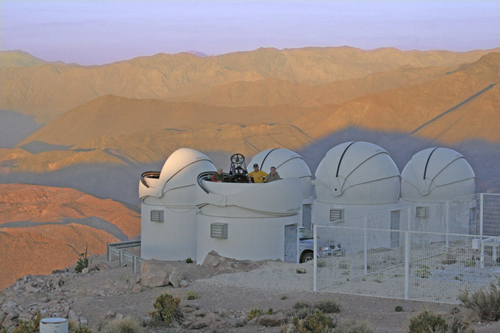 Star Shadows Remote Observatory (SSRO) North was one of the first joint ventures in remote astroimaging. It was located at "New Mexico Skies", where the team used a 16" RCOS and 4" Takahashi FSQ on a Paramount ME, with an SBIG STL11K camera attached to each scope. SSRO-North operated until 2015. The SSRO-South telescope is one of five PROMPT telescopes designed to analyze gamma ray bursts in the southern hemisphere. PROMPT2 was modified in December of 2006 by teams from SSRO and UNC to allow for wide and narrow band imaging. SSRO South is fully equipped with an excellent RCOS Open Truss 16" Ritchey-Chretien telescope and an FLI 16803 imaging camera; guiding is via an OAG. The telescope is mounted on a Planewave 200HR mount. The telescope is operated remotely via the internet using ACP, Maxim, FocusMax, RCOS TCC, and Scitech. SSRO controls the scope for 2 weeks/month (when the moon is down); UNC has control the remainder of the month. Priority tasking for gamma ray burst analysis remains intact. For a live PROMPT webcam view, click here. The skies here are unbelievable as evidenced by this seeing monitor graph above showing steady 0.5 arc sec readings.